Available in 35ml/70ml bottle sizes. The Glycol Buffer compliant with the CDC requirements for vaccine storage monitoring. It is used with LogTag® ST100K-15 or ST100K-30 sensors connected to any TRED30-16R or TREX-8 temperature logger. Order Code 200-000030 (Kit with seal, vial & cap, external temperature probe not included). Operating temperature range -10°C to +60°C (With glycol fill). Storage temperature range -20°C to +60°C (Not liquid filled). 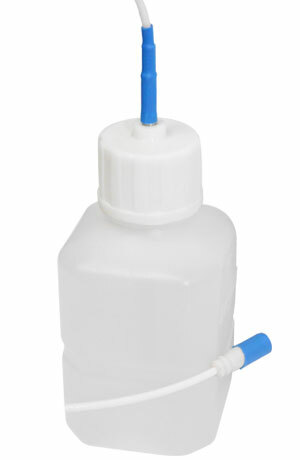 Case material HDPE vial / PP cap. Size 79(H) x 38(W) x 38(D) without sensor installed. Weight 14g without liquid or sensor.